Our company, B. M Natha Exports, was born in 2007 and since then we are an established and respected name in the field of manufacturing and exporting of Marble God Statues, Temples, Artifacts And Wooden Doors And Temples. Our collection is carved out from finest quality marble in various sizes, shapes, design and colour combination as per the specification provided by the our customers. Professionalism is our forte and we provide quality products at most competitive price and assure on time delivery. Each and every artifact possess unmatched beauty, quality, durability, finish and elegance. India is the country with diverse cultural reflection, history, heritage and traditions. Through its handicrafts, India presents true colors of art. India is one of the major producers and suppliers of handicrafts and counts for a strong labor intensive cottage based industry that is spread in rural as well as urban areas. We possess advanced manufacturing facility with full set-up over a plot area of 2,500 square feet. The facility is furnished with several tools, instruments and machines that enable us in carving our range of marble god statues, temples and artifacts with perfection. We are also backed by by sound warehousing facility that enables us to effectively store our range of artifacts, temples and statues. India offers a gamut of options from the handicraft industry, which includes, textiles, wood, ceramic, metal, stones and glass handicrafts. These handicrafts are one of the unique medium of expressing originality. 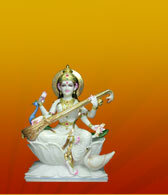 Statues and idols : Intricate carvings of Gods and Goddesses in material like marble, brass, mud, lak, wooden and terracotta. Ornaments : Available in a range of patterns, styles and compositions in different material like brass, copper, bronze, bell metal and many more. Hand printed textiles : Block, printing, screen printing, batik, bandhej, kalamkari and bandhani Wooden decorative articles. The Indian handicrafts industry is going through a major change with changing tastes and trends of consumer. Incorporation of new designs and patterns results in increasing demand of handicraft products. There is been a drastic change in the usage of raw material, product development and production facilities. Handicraft industry is divided in to both organized and unorganized sector that helps in the upliftment of country's economy. We promised unmatched and impeccable quality. 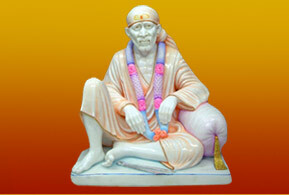 This quality gets reflected in our range of artifacts, marble god statues and temples. Due to the result of our undeterred efforts, we accomplished a position on global platform. The process starts from the procurement of marble stones for designing and goes until the final dispatch of artifacts is taken care under the monitoring of our quality professionals. 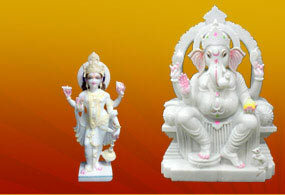 They thoroughly inspect the sculptures and ensure the flawless and defect free dispatching from our end. We take special care of the packaging and transportation of statues and artifacts, so that these reach client's end without any damage. We pack them in blister packaging and corrugated or wooden boxes, knowing their fragile nature. 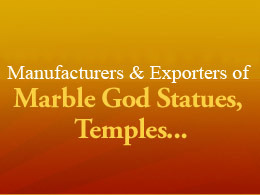 We are one of the reputed names who come up with complete designing and installation solutions for marble god statues, temples and artifacts. In our endeavor to meet the variegated demands of individuals, we have been able to design and assemble several statues, temples and artifacts at our clients premises.